Casa Toscana boasts a variety of remarkable venues that can cater for all needs, from cherished weddings in the breathtaking Rubica Hall & Chapel, to private wine tasting events in our unique underground wine cellar. 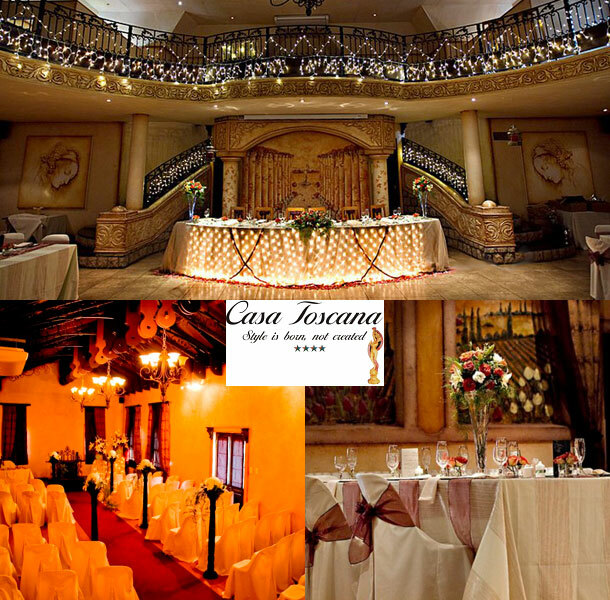 No matter the occasion, Casa Toscana has the venue and the passion to make it a truly unforgettable experience. Rubica Hall, the flagship venue of Casa Toscana, is the quintessence of our tireless dedication to the pursuit of perfection. The Rubica Hall is ideal for any occasion as it was designed and built to be convenient, practical and inimitably beautiful. The stylish, warm and intimate ambiance makes Rubica the ideal venue for breathtaking weddings and unforgettable functions. There is no sight more awe-inspiring than Rubica Hall setup for a wedding or function. With its masterfully painted murals, warm lighting and simply unforgettable atmosphere, Rubica is truly a Tuscan heaven. This unrivalled ambiance blends seamlessly with the chapel, which reaffirms Casa Toscana’s unbridled style and class. The wine cellar is a traditional underground wine cellar, but done with more style and less clutter. It’s a fusion of the classic and the modern, giving it a special, yet versatile ambiance, that has in the past, been used for dazzling weddings, jovial wine tastings and even formal corporate presentations. Due to this versatility, the wine cellar can be setup to suit almost any theme or décor.. The venue is best suited to set menus, but can accommodate buffets and cocktail functions as well. Set in Casa Toscana’s beautiful gardens, are two dazzling venues. The Garden Venue combines practicality with natural beauty to create the perfect outdoors venue. Towering trees and a majestic oak tree in the centre provides the venue with natural shade while, at the same time, creating a unity with nature as birds celebrate in song, the joining of two souls. The gazebo is a Tuscan fairytale and is the perfect venue for an intimate wedding ceremony. Surrounded by stylish Tuscan gardens, this venue is a monument to Casa Toscana’s affinity for romance and style. The wedding packages have been setup in such a way so that they are transparent, easy to understand, convenient and offer a high level of quality at an amazing value. The function packages were designed to offer the flexibility required to cater for any event, from large formal gala events in the Rubica Hall to intimate private dinners in the wine cellar. A variety of menu options are available that can cater for any need, ranging from delicious buffet menus to meticulously plated set menus that are as magnificent to look at as they are on the palate. The wedding co-ordinator will guide and assist you in the planning and coordination of your wedding, from helping select the perfect décor to assisting you with the dynamics of the day. To book your wedding at this lovely venue telephone the team on +27 (0)12 348-8820. Alternatively for further details or to send an enquiry visit Casa Toscana Lodge.